Yesterday, was my son's first "sick day!" (Woo-hoo...yeah!) Now I understand why, whenever we stayed home sick from school as kids, which happened soooo rarely, my mom basically made a full-blown holiday out of it. She'd buy us McDonald's for lunch (a rare treat...shhh, don't tell the other kids!) and bring us 7-up "to settle our tummies." See that smile on my face? Yeah, I was happy to spend time with my little man! All of us back together again! So family home evening basically lasted all day. I love it when that happens. We played games and made Valentines for each other and for friends. After dinner, with Steve home, we cut out hearts together around the kitchen table. For the lesson, we cracked open our scriptures and looked up verses about the heart & love. We read aloud to each other things like: God so loved the world that he gave his only begotten Son...and ye shall offer for a sacrifice unto me a broken heart and a contrite spirit...and I will tell you in your mind and in your heart by the Holy Ghost, which shall come upon you...It was fun. And Guy was so proud to be able to read verses aloud to the family. After we'd cut out enough hearts, we went on a secret service adventure together to continue the time-honored tradition of "heart-attacking" someone for Valentine's Day. The kids thought it was a blast and we had written some scripture references on some of the hearts. Another extremely simple but totally enjoyable FHE that ended with ice cream. PS - Remember to check out That Good Part's FHE report today! Also, our Secret Service Notebook idea is being featured on The Friend website today. I checked out the Friend link-short and to the point suggestions-would be nice if they added some photos. Looks like a lovely heartfelt FHE!!! awesome and great idea. Today I'm going to "heart attack" someone who needs it, by posting hearts all over her front door! Really cute. We had a snow day today, and spent a lot of time doing similar things. The girls made Valentine's (although, the older girls didn't want me in there, so they could surprise everyone), went sledding, and watched movies. I hung around and made red-velvet waffles and a cream cheese glaze for topping. It was a nice day. 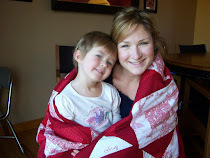 I love seeing your cute ideas - and most of all - the happiness that infuses your home during FHE. hey, i still want a Happy Meal when I'm sick...but I was not happy to learn you get this teeny box of fries AND those horrible slices of apples that are dunked in something to keep them fresh (or green) looking. All I want are the toys to give to the wee ones....well, that and the McD for me. What a bummer! Thank you so much for the Friend link! The church magazines really do help make FHE easier to plan and execute. And it looks like your family had another wonderful evening, even if your little boy was feeling a bit sick. We had a great time yesterday as well. After school my daughter and I made treats, and when Dad came home we delivered them together. Even after almost 30 years, we love making new family home evening memories! I love that sick day idea! And what a great FHE. It's always nice to have everyone happy. I love your hearts with the scriptures on them. This was much better than when I was young. I watched shows like Andy Griffith and Leave it to Beaver for the day. That looks great, the hearts with scriptures. I remember when I was sick, way back, I watched Andy Griffith all day! Looks like everyone enjoyed the "sick" day! Our FHE was similar but kind of backwards from yours. I had hearts with previously written scripture references, hymns, or Primary songs about hearts and love. The kids took turns picking a heart and we'd either sing or look up the scripture and talk about it. And we miss you guys...but that has nothing to do with what you wrote...I just wanted to say that! :) See you soon!